UNITED STATES 1950s: Parade on street under 'New York' title / Douglas MacArthur waves in car / View of buildings, ticker tape / Views of crowd cheering. hd00:13UNITED STATES 1950s – A girl drops a football that her friends throw to her as they are playing ball in front of a building. hd01:46CIRCA 1939 - A machinery company, restaurant and bakery and Boy Scouts are shown in a Jewish section of New York City. 4k00:21DORTMUND, GERMANY 1966: V?ra ?Ã¡slavskÃ¡ Czechoslovakia women's uneven bars 16th Artistic Gymnastics World Championships. 4k00:144k. 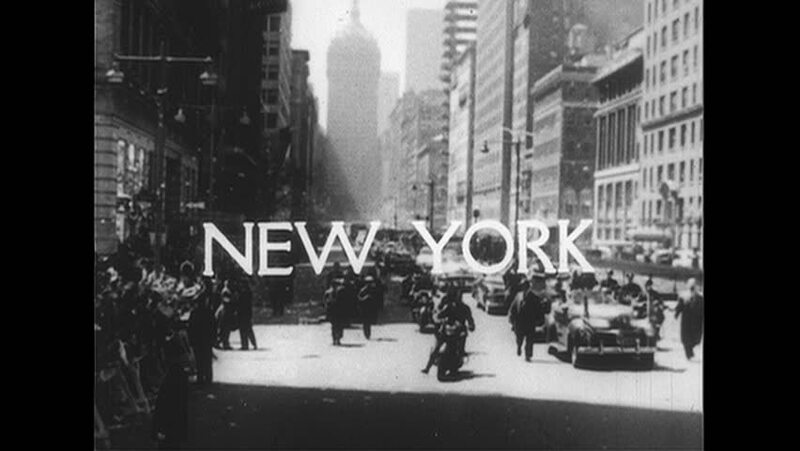 Screensaver of several videos with the text "New York City" with modern transitions. Black and white footage of the world's most famous city. hd00:37CIRCA 1934 - Men, women, and kids are shown engaging in various sports, such as wrestling and ice skating and playground games.